Information technology security policies are the practices and rules that an enterprise uses to protect, manage, maintain, and monitor its information resources. These policies are carefully developed, implemented, documented, evaluated, and reviewed on a timely basis to ensure a secured and properly managed network system. The network security policy management solution intelligently automates and simplifies the network security policy management process across the cloud, SDNs, and on-premise firewalls. The cloud-based segment is expected to account for a significant share of the network security policy management market over the forecast period. The global network security policy management market is currently driven by increase in the number and intensity of cyber-attacks. The global network security policy management market was valued at US$ 1,297.6 Mn in 2017 and is expected to expand at a CAGR of 8.2% during the forecast period. Growing focus on addressing digital business risks, and focus on building detection and response capabilities are some of the factors expected to drive the network security policy management market. However, lack of awareness about cyber threats in some regions is a factor restraining the market. Many organizations do not provide requisite training and education about cyber threats to their employees as they themselves are not aware about it. Availability of network security policy management solutions on-demand via a SaaS model is anticipated to present significant opportunities for the network security policy management market.The SaaS option reduces the capital expenditure with the provision of subscription based, scaling pricing model. The end-user can process network security policy changes in real time across any cloud security control and on-premise security device. The global network security policy management market is expected to be driven by significant growth in Asia Pacific. Theregion is estimated to constitute a significant market share during the forecast period, with China, India, and Japan contributing most to the region’s revenue. The network security policy managementmarket in Asia Pacific is mainly driven by rising adoption of cloud-based services, growing trend of industrial automation, and improving IT infrastructure. This is because increasing foreign investments and improving economic conditions supports technological development and growth of IT industries. Network security has huge potential in the emerging markets of Asia Pacific due to increasing demand for cyber security solutions and services. Moreover, the economies are focusing on increasing investments in Artificial Intelligence which would help the companies to integrate AI with network security management. In July 2017, China released its next generation AI development plan. The plan includes extensive government investments and funding in order to increase the adoption of AI solutions among companies. The market in Asia Pacificis estimated to expand at a rapid CAGR of 8.9% from 2018 to 2026.In this region, demand for network security as a service is primarily driven by small and medium businesses and cloud based delivery models. The network security policy management market in Europe is mainly driven by the adoption of GDPR (General Data Protection Regulation) to comply with the strict regulations and policies put forth by the European Union. Also, services segment is highly attractive in the region. Growing popularity of connected devices, Bring Your Own Devices (BYOD), and IoT is estimated to drive the segment in the network security policy management market. In Europe, increased digitization, use of mobile devices for e-mail access, and online browsing are some of the key factors expected to fuel the growth of the network security policy management market. The U.K., Germany, France, and Italy undertake considerable efforts toward the development of IT security services. Network security policy management solutions are being implemented to manage, protect, and monitor information transactions, especially in the BFSI, IT & Telecom,and retail industries. Major players operating in the network security policy management market include Palo Alto Networks, Inc., AlgoSec Inc., Check Point Software Technologies Ltd., Forcepoint LLC, FireMon, LLC.,Hewlett Packard Enterprise Development LP, IBM Corporation, Juniper Networks, Inc., Sophos Ltd., and Tufin Software Technologies Ltd.. The report ‘Network Security Policy Management Market – Global Industry Analysis, Size, Share, Growth, Trends and Forecast, 2018 – 2026’ provides analysis of the network security policy management market for the period 2016 to 2026, wherein 2018 to 2026 is the forecast period, 2017 is considered as the base year, and the data for 2016 has been provided as historical information. The report covers all the trends and technologies that are likely to play a major role in the expansion of the network security policy management market during the forecast period. It highlights the drivers, restraints, and opportunities expected to influence the expansion of the market during this period. The study provides a holistic perspective on the expansion of the market, in terms of revenue (in US$ Mn), across different geographical regions: North America, Europe, Asia Pacific, Middle East & Africa, and South America. The report highlights key trends affecting the market on a global scale. Furthermore, prominent countries/regions covered in the report include the U.S, Canada, Germany, France, the U.K, China, India, Japan, GCC countries,South Africa, and Brazil. This report analyzes and forecasts the network security policy management market at the global and regional level. The market has been forecasted based on revenue (US$ Mn) from 2018 to 2026. The study includes drivers and restraints of the network security policy management market. It covers the region-wise impact of these drivers and restraints during the forecast period. The study also provides market share of major players in terms of revenue and percentage share for the global market. 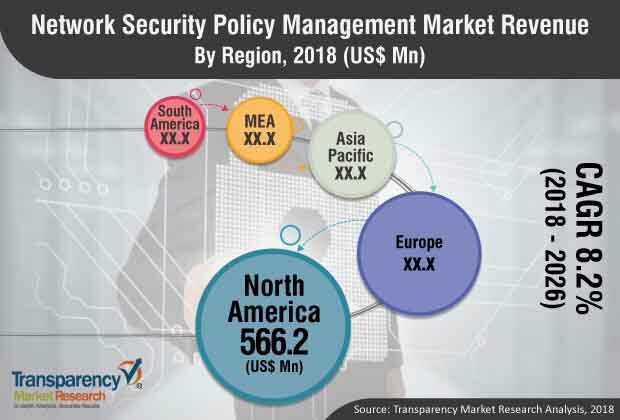 This research study on the network security policy management market provides a detailed analysis based on different segmentation categories such as component, solution, enterprise size, industry vertical, and region. Based on component, the market has been classified into software and services. Based on software, the market has been classified into on-premise and cloud-based. The cloud segment has been further split into public, private, and hybrid. Based on solution, the market has been classified into security policy management, change management system, risk and vulnerability analysis, and application connectivity management. In terms ofenterprise size, the market has been divided into small and medium enterprises and large enterprises. Furthermore, based on region, the market has been classified into North America, Europe, Asia Pacific, Middle East & Africa, and South America. The report highlightswell-established players operating in the market, including Palo Alto Networks, Inc., AlgoSec Inc., Check Point Software Technologies Ltd., Forcepoint LLC, FireMon, LLC.,Hewlett Packard Enterprise Development LP, IBM Corporation, Juniper Networks, Inc., Sophos Ltd., and Tufin Software Technologies Ltd. These key players are looking to increase their market share by expanding their current network security policy management market offerings in emerging economies.